Looking for the perfect gift? 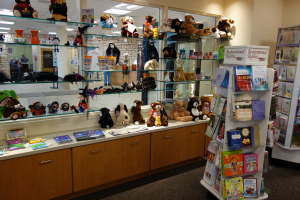 Visit the WMH Gift Shop - operated by the War Memorial Hospital Auxiliary. Fresh flowers, candy, stuffed animals, books, and many other gift items are on display and ready for purchase at the Gift Shop in our main entrance lobby. Monday - Friday: 9:30 a.m. - 7 p.m.
Saturday: 9:30 a.m. - 4 p.m.
* Proceeds from Gift Shop sales are used by the WMH Auxiliary to purchase patient-care equipment. Upon incorporation in 1903, the War Memorial Hospital Auxiliary pledged to provide service and funding for the hospital and the community. More than a century later, the time-honored tradition continues and is never more evident than when the organization bestows its annual gifts upon the hospital. In 2013, the Auxiliary donated more than $55,000 in patient-care items to the hospital. 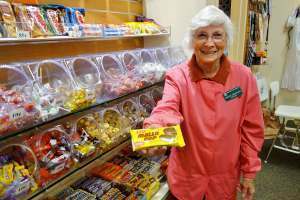 Funds are raised through a number of events, fund drives, and gift shop sales - all performed by the organization's over 200 volunteer members. The Board of Trustees and Staff at WMH are extremely appreciative of the support and generosity of the Auxiliary!